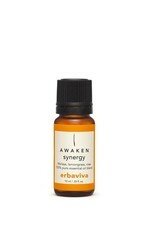 Awaken Synergy Essential Oil - 10ml - Springfield Mercantile Co.
Invigorate the body and soul with this uplifting blend of organic melissa, lemongrass and rose essential oils that enliven and stimulate your whole being. A rejuvenating and beautifully-scented antidote to a tiring day. Use in a diffuser or mix into our Organic Carrier oil. *Lavandula angustifolia (lavender) flower oil, *citrus nobilis (mandarin) peel oil, *citrus aurantium dulcis (sweet orange) oil, *cymbopogon citriodora (lemongrass) oil, *citrus bergamia (bergamot) oil, *zingiber officinale (ginger) root oil, *anthemis nobilis (chamomile) flower oil, *pelargonium graveolens (rose geranium) oil, *melissa officinalis oil, *rosa damascena (rose) flower oil.